The initial formation of the Toukley RSL Club was brought about by the U.T.L. Sub-Branch. The Upper Tuggerah Lakes Sub-Branch was formed on the 9th November 1948 at the “Holmesville” homestead which was opposite the present Clubhouse by 10 returned men from World War I & II. They had five pounds in the Kitty at this Inaugural Meeting with the election of L.Brown as President, N.Radley Secretary and Treasurer A.Lawson. Meetings were held in the Toukley Progress Hall. On the 24th October 1949 the Sub-Branch purchased the old Wyong Bakehouse for One Hundred & Four pounds, five shillings and with voluntary labour reconstructed the building with suitable additions which when finished was a double frontage weatherboard building on land purchased where the present main entrance to the Club is now. The Inaugural Meeting of the U.T.L. Sub-Branch Club was held on the 21st March 1955, consisting of RSL personnel only in accordance with the Constitution of the Returned Services League of Australia (NSW Branch), a requirement of Parliament. Elected was C.Roberts President, Secretary/Treasurer R.Weeks. Following the required establishment of the Club, a Management Committee formed with R.G.Brown President, R.Weeks Secretary and A.McLauchlan Treasurer on the 15th August 1955. The members of the U.T.L. Sub-Branch Club agreed to pay a weekly rental of five pounds to the Landlord U.T.L. Sub-Branch dating back to the 1st April 1955. The Upper Tuggerah Lakes Sub-Branch Club was then officially registered with NSW State Govt Liquor Licensing board on the 26th October 1955. The first A.G.M. (3 months) was held on the 6th February 1956. Our first poker machines were 5 in number consisting of 1 “two bobber”, 2 deeners (shillings), 1 zac (sixpence) and a one penny which was for Welfare. In those days the machines were hired and receiving only a % of the net takings. 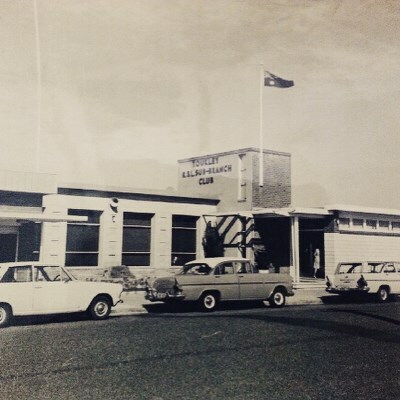 A new brick building was erected in 1963 and named the Toukley RSL Sub-Branch Club. Major extensions and renovations thereafter were carried out in 1968 and 1973 (the year of the cyclone). Further work has continued on the building over the years, with the last renovations completed in 2016. In the late 70’s and early 80’s the Club and Sub-Branch purchased all the land bound by the four present streets with the exception of the Police Station area. Application for purchase was made over the years in the 60’s and 70’s before the brick station was built, to no avail. In those days the Govt Dept of Justice was the boss. The area where the old Catholic Church was situated, coner Holmes Ave & the Main Road was purchased by the Club for $70,000 in 1969. The Memorial blocks were also purchased by the Club in 1970 the Memorial being finished and dedicated in the year 1975. The Club was also responsible for the building of the Toukley RSL Youth Centre. In 1972 the State Government passed legislation that all Licensed Clubs be registered under State Company Law with the Registered Clubs Act. We have since then traded as a Company Limited under Guarantee and known as the Toukley RSL Sub-Branch Club Limited. Life Members are:- Andrew McLaughlan (deceased), Roydon Secomb (deceased), John Chesher (deceased), Martin Owens (deceased), Charles Hinds (deceased), Kevin Cahill (deceased), Ronald Saville, Terry Smith (deceased), Bill Armstrong, Jock Crooks (deceased), Noel Dyson (deceased), Ronald Miller (deceased), Robert Cubitt, William Baldry, Harry Burdon, John Maxted (deceased), Jack Muller (deceased), Mary Muller, Ken Piper, Frank Sutton (deceased), Ron Marlin. Amenity Clubs are:- Men's Bowls, Women's Bowls, Disabled Bowlers, Indoor Bowls, Snooker & Billiards, Seniors Snooker, Pipes & Drums, Euchre, “500”, Pistol, Chess, Fishing, Musicians & Performers. Longest Serving Secretary Manager W.Armstrong 21 years. Longest Serving Employee H.McCormick, from casual clerk typist to Office Manager 31 years. It is simply not possible to consider the growth of Toukley RSL without acknowledging the countless thousands of hours generously given by volunteers over the life of the Club. Many people, some who will never be properly thanked, have literally given their blood, sweat and tears freely to ensure the success of Toukley RSL – Proud of our Past, Confident of our Future.